A well-dressed Claremont citrus grower poses among his trees in this undated photo from the Boynton Collection of Early Claremont, Honnold-Mudd Library. 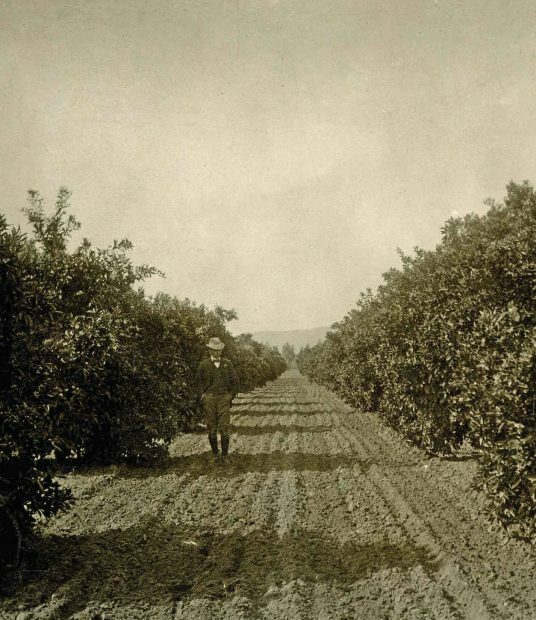 In 1888, the same year that an upstart college moved in, the town of Claremont planted its first citrus trees. At the time, gravel and shrubs dominated the unincorporated town in a region once inhabited by Native Americans of the Serrano tribe. Twelve years later, Claremont’s 250 residents belonged to one of two camps—the College or the citrus industry. Early 20th-century Claremont was a citrus boomtown, a battleground for countless brands and packinghouses. Until the mid-1930s, according to historian Richard Barker, citrus was one of California’s largest industries, second only to oil. Particularly in Claremont, “the economy was driven by citrus.” Once, Queen Victoria ordered a shipment of Claremont oranges for her birthday. 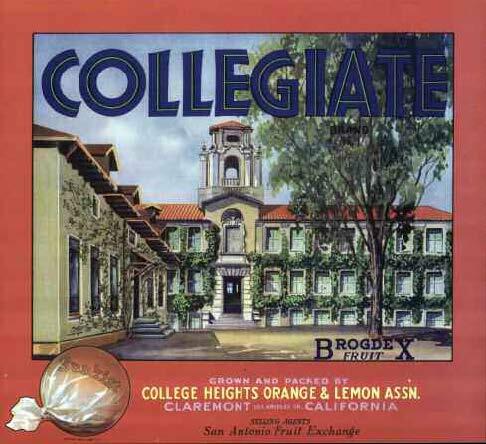 One packager, known as the College Heights Orange & Lemon Association, sold citrus under numerous names: “Athlete,” “College Heights,” “Umpire,” and “Collegiate.” A 1930s packing label for the Collegiate brand, pictured above, featured a vintage image of Pomona’s Mason Hall, along with the long-since demolished Harwood Hall for Botany, which once occupied the center of the Stanley Academic Quadrangle. Many growers were members of the California Fruit Growers Exchange, founded in Claremont in 1893 under a different name. Membership soon exploded, and in 1952, the group formally adopted the name from their longtime advertising campaign—Sunkist.